You can’t open any QGS project files that contain a reference to such an OpenLayers base map. You can’t use it to insert OpenLayers base maps (e.g. OSM, Google, Bing, Stamen, Yahoo, …) into your new map projects anymore. You could either load the project in question on another machine in an older QGIS version, or manually edit the QPS project file to remove the layer. Just make sure you don’t forget a single reference! In my case I had not only to remove the corresponding <legendlayer> block in the <legend> block, but also the corresponding <maplayer> block in the <projectlayers> block, and also the layercount attribute in said <projectlayers> block. Line 3 sets the URL for where the map tiles can be found. As you can see, here I referenced the Stamen Toner map, but you can easily replace the URL with the TMS server you’re interested in. You can find the necessary information on most map tile provider’s websites. Line 15 sets the projection for the map tiles. In most cases this should be either EPSG 3857 or 900913, which is an unofficial alias for 3857 (spelling GOOGLE in quasi-leetspeak). 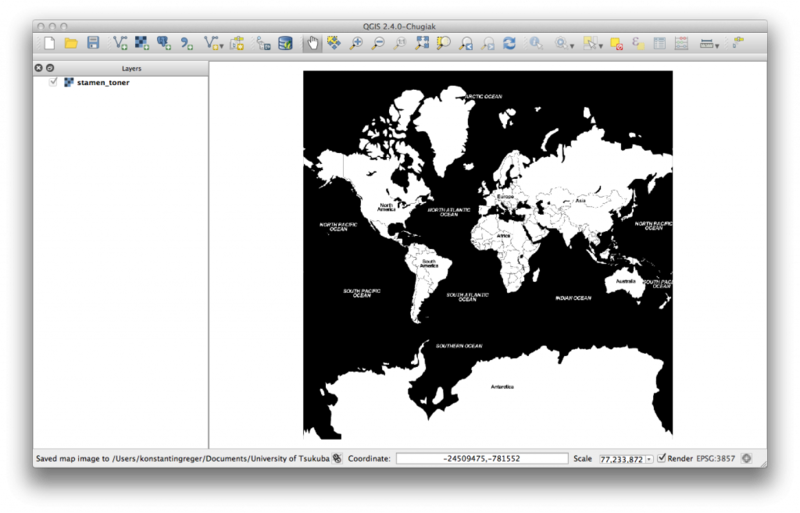 And there you go: Stamen Toner map tiles in QGIS 2.4! Obviously I will update this article once the great OpenLayers plugin becomes compatible with QGIS 2.4. There seems to be an update already looming in the GitHub repo… UPDATE: As of today (July 8th, 2014) the OpenLayers plugin has been updated to work in QGIS 2.4! Big thanks have to go out to Pirmin Kalberer, the plugin author, and all supporters. Only one little caveat: Whereas in the past the OpenLayers plugin’s menu resided in the Plugins menu, it now has a new home in the Web menu. Thank you for your post, I just couldn’t find the new location of openstreetmap plugin !! I have had the same [problem, but just worked through -- I reinstalled the open layers plugin under the plugin menu and then it appeared in the dropbox under the web menu as it’s new location -- openstreetmap is there. Thank you for your post! My just starting to learn QGIS and I couldn’t find the openlayers plugin. Thank you! I couldn’t find where the new plugin was located. However, once I found it. I am still getting an error. I get an error with any of the OpenLayer styles. I am wondering if you happen to know what is going on. I am bookmarking this site. You explained and lot and I just found the site tonight. I’m glad I could help. Does your problem still exist? Have you tried turning it off and on again…? (Sorry, uncalled-for IT Crowd reference.) In all seriousness, some people report that uninstalling and reinstalling plugins solves many Python-related issues. Let us know how it went!